I think you may also heard that how you can make your own web browser for Android device, but if you heard this for the first time then you can keep reading and you’ll no need any coding to create a custom browser for your Android phone. For creating other applications for android mobile phones you need to be knowledge of C. C++ and JAVA Language but you don’t need any coding for this. If you are fond of using internet on your android mobile phone then you must to create and enjoy your own web browser because it allows you to add your own Logo, Splash screen, homepage etc. Especially if you are running a blog/website (Or a facebook fan page) then it is more useful for you because you can add your own URL as a homepage. You can also tell your friends & fans to download your custom browser. In fact, We are not going to make a fresh new application but there is a pre-made browser which allows us some Customization which we need and I think is enough. So we can make the following customization in the web browser app. 1 Custom URL as a Homepage: You can set any URL as a homepage. Add URL of a webpage you’re using mostly or your blog/website. 3 Your own splash screen: Add an image or photo you love to see at the time you starting your browser, the image you’ll see when browser is opening. 4 Your own Browser Name: Name your browser what name you want to see every time so it will just before you any time. It may be your own name, company, blog, website, fan-page or anything else. 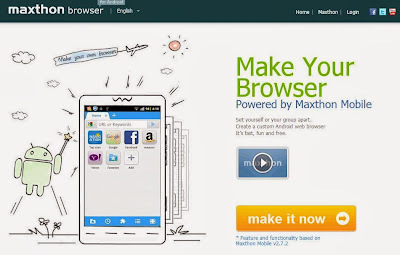 Now lets Start how you can make a customized browser for your android device. 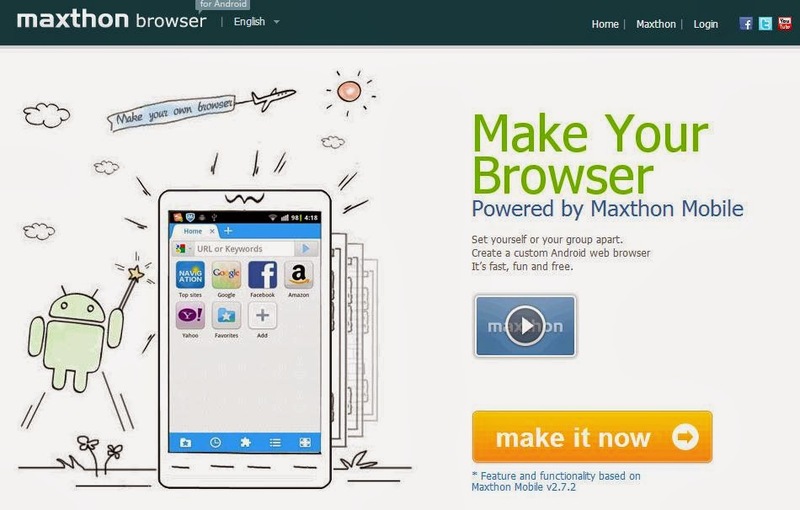 So we’ll use ‘Maxthon’ – a Free online tool which allow you to make your own customized browser just in minutes, Of course there are some other tools also available which can be used in order to create a web browser for android mobile phone with out any coding but we’ll use Maxthon. So below are the steps to follow in order to make a browser online for free. Step-2: Now click on “Make It Now” Button. In a New page you will see 6 steps you’ve to follow. So in the first step Enter a name for your browser in the box and scroll down to the second step. Step-3: In next step it will ask you to upload an icon, (a logo) so upload a logo from your computer or mobile. Or you can also set default icon if you don’t have an icon. Step-4: In next step you can set a custom URL as a browser homepage. And in the 4th step Select a theme from the pre-made themes. 10 themes are available, highlight one by one from the drop down list to check and select which one you like. Step-5: In this step it will ask you to upload a photo(of 480x800) to set as a Splash Screen or Set default as a splash screen. Step-6: The next step is asking you for your e-mail address to receive direct link for your browser to download. So enter your email address and click on the button “Create Android Browser”. You’ll see a popup box, so wait a moment and click Download when appears. So Friends this was a post was written to create a custom web browser for your android mobile phone. I hope you'll enjoy after creating a custom web browser, Also don't forget to leave your valuable comment if you liked this post or any problem or suggestions.